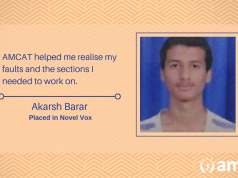 Read AMCAT Achievers diary to get inspired. 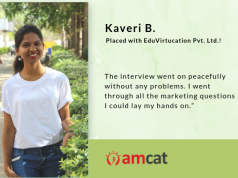 It is always inspiring to hear the success stories of our AMCAT achievers. Their stories don’t just inspire you to do better and strive to excel but teach us the meaning of what it is like to have so many rely on us and reap benefits of an idea. So, today we bring to you the story of Ria Mehta told in her own words. A B.COm graduate, Ria did not want to sit at home and be dependant on others. She always wanted to make good use of her education and do something she would be proud of and which will make her independent. Why did you opt for the AMCAT? How was the overall experience of the test? “The test was pretty systematic and good. You should know your basics and the test should be easy for you,” added Ria Mehta. How many interview calls did you receive and how was the interview process? Would you recommend the AMCAT Test to others? If yes, why? “Yes, I would definitely recommend AMCAT to other people. In the end, do you have any tips for other job seekers? “Just be confident,” says Ria Mehta. Confidence is the right key to success, especially in job interviews and Ria Mehta points that out. 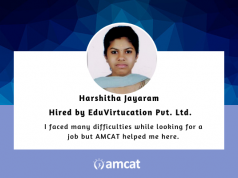 She also says that one should go through the basics and get them right to do well in the tests, whether it be the AMCAT Test or job interviews. Ria Mehta with her pearls of wisdom has made the whole AMCAT family proud. 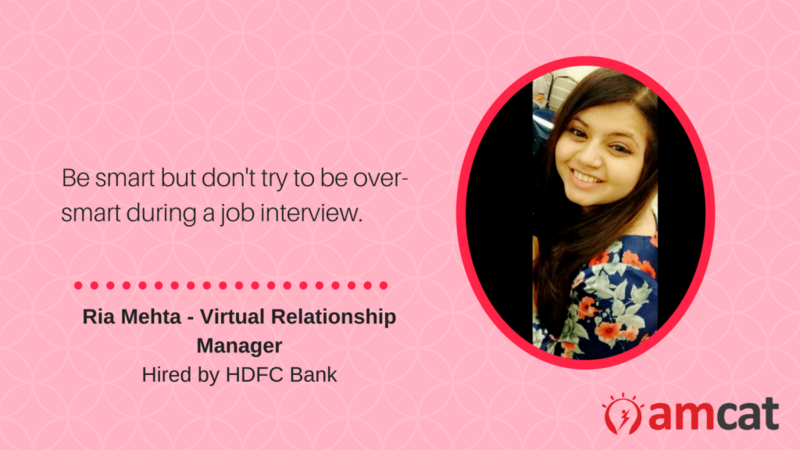 Selected as the Virtual Relationship Manager for HDFC Bank, Ria Mehta has proven that all it takes is grit, determination, confidence and the right dose of hard-work to get through. So, hurry up. Find IT jobs or be a part of the HDFC drive or look for jobs catering to your city such as jobs in Delhi or jobs in Bangalore and create your own story.